Baffles are metal separators used in the shell side of a shell & tube heat exchangers. Baffles helping in shaping the flow of the shell side flow in such a way that it flows at right angles to the tube bundle. The crossflow pattern on the shell side caused by presence of baffles, enables better contact of the shell side fluid with the tube surface. This enhances the heat transfer efficiency in a shell & tube exchanger. Another advantage of having shell side baffles is the support that they provide to the tube bundles and minimize the potential damage caused by flow induced vibration in the tubes. TEMA standards provide guidelines and recommendations for shell & tube exchanger design. Minimum baffle spacing should be one fifth of the Shell Internal Diameter (ID) OR 2 inch, whichever is greater - as per the TEMA standards. Maximum baffle spacing should not be greater than the shell ID (internal diameter) itself. 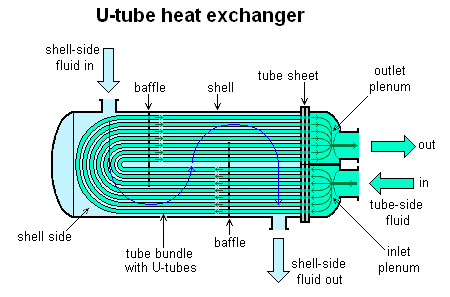 Closely placed baffles result in poor penetration of the tube bundle by the shellside fluid. It also makes it difficult to mechanically clean the outsides of the tube bundle. Large baffle spacing means shellside fluid flowing mostly along the direction of tubes. Crossflow is minimized, thereby decreasing the heat transfer and lowering overall efficiency. If a large span of tube bundle is unsupported by baffle (in case of large baffle spacing), it is prone to damage from flow induced vibrations in the tubes. Hence baffle separation must be optimized considering these trade offs. It is recommended to consider baffle spacing between 0.3 to 0.6 times of shell ID. Finally, the baffle dimensions and baffle spacing that you decide as per your design should be clearly specified in the heat exchanger datasheet. TEMA is the 'Tubular Exchange Manufacturer's Association'. TEMA standards are the leading industry guidelines for design of shell & tube heat exchangers.